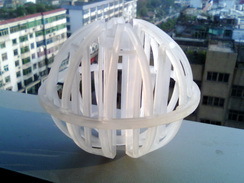 Plastic JINTAI T-Packs is a hollow spherical column packing constructed of a unique network of ribs, struts, and drip rods. Its geometry was totally revolutionary and it continues to be the packing to which all others are compared. 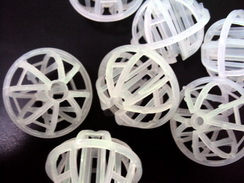 Plastic JINTAI T-Packs are distinguished from other packing by its superior geometric shape. 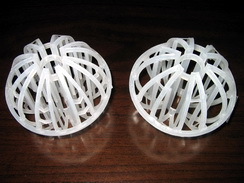 Their spherical shape allows each element to roll into the "packed position" without forming void areas common to irregular shaped packing or those with excessive pins and appurtenances. With JINTAI T-Packs, there is no need for allowances for settling and nesting is virtually impossible. The round JINTAI T-Packs offers reliable and predictable loading of your tower which means reliable and predictable performance. In addition to the superior geometric shape, an active surface area is vital to mass transfer. The unique network of ribs, struts and drip rods have proven to give the JINTAI T-Packs a distinct advantage in providing excellent wetting qualities and maintaining liquid distribution through the packed bed. JINTAI T-Packs are available in PP, PE, PVDF, PVC, CPVC and other plastic material.